From left slilky merino jersey and wool/cotton flowerpins iron, rainwater and vinegar , euca leaves boiled half an hour before. Second the last privet berries from the freezer , bourette silk and small pieces of silk inside , half seewater and half tap water. 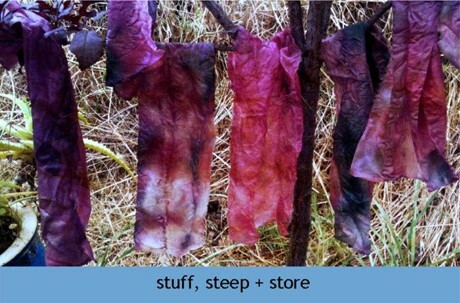 Watecolour paper with wildstrawberry leaves, shells from garlic purple inside , outside strawberrry leaves , onion on the top and rust in the bottom, half seewater and half boiled water. The last one Hazel bark half seewater and half tapwater.